Automotive casting technology in china's automotive casting industry is developed very quickly,by now,automotive casting china can produce automotive engine blocks, auto wheel hub castings,Auto shock absorber inertia ring castings,auto heads casting, cast iron automotive wheels,Auto Brake Disc Castings,and other auto casting parts etc. now in china, automotive metal casting all most all taken in gray iron foundries and ductile iron foundries. china automobile foundries use cupola or induction furnaces to melt the iron in automotive casting process so that to melt the iron use to pour the automtive casting parts with sand molding caves. 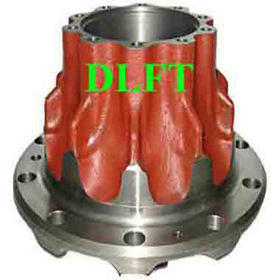 the things is as same as automotive casting manufacturers india. China automotive casting suppliers make automotive sand casting In ferrous foundries, moulds are traditionally made from green sand, and the Cores can be made from thermosetting phenol-formaldehyde resins or similar resins mixed with sand which is then heated -hot boxmethod or from amine-cured urethane sand mixtures which cure at room temperature -cold boxmethod. The resin sand mixture is poured into a core box which has a cavity in the desired shape of the core. automotive casting and machining:The auto part castings produced in gray iron castings, such as cast iron automotive engine blocks,cast iron auto heads,cast iron automotive wheels, and other cast iron auto parts etc. material according to ASTM.JIS.BS.DIN standards. and all are OEM auto parts castings made accrding to importers' drawings, samples, or patterns. High-production coremaking is characteristic of the auto castings industry in china. Hot box phenol-formaldehyde coremaking replaced oil-sand cores in china automotive castings indutries. this can improve automotive casting components quality. automotive parts machining of engine blocks, crankshafts, transmissions auto clutches castings,auto body casting,and other components is characteristic of the auto industry. auto parts machining processes are found within various parts manufacturing facilities and are the dominant process in engine, transmission and bearing production. Components such as camshafts, gears, differential pinions and brake drums are produced in machining operations. One-person machining stations are increasingly replaced by multiple station machines, and CNC machining center is most used in china automotive castings machining workshops. to make sure the automotive castings machining quality is higher and better than automotive casting manufacturers india. Grinding and tool sharpening the auto part castings may present a danger of hard metal disease unless cobalt exposure is measured and controlled. Grinding wheels should be fitted with screens, and eye and face protection and respiratory protective equipment should be worn by grinders. automotive casting companies in china now can assembled the machined cast iron auto parts into a finished component according to importers requested, but mostly just exporting these automotive casting parts or cast iron car parts without assembling. This entry was posted in MISCELANEOS by DLFT. Bookmark the permalink.